NEW! Real Time Refills (RTR) with ILD now available! Starting Sept 27, 2016, Tracfone, the parent company of Simple, will increase their reseller pricing further! In order for us to continue selling this product online, we have to charge 2% extra so we will not be losing on this product considering the costs of selling this online. However, you still save with us compared to local store or directly from the provider since we don’t charge sales taxes! Simple Mobile makes life real simple like no one else! Best features. 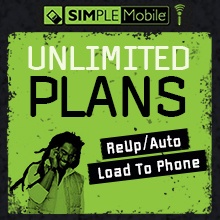 Affordable Unlimited Monthly Plans in various denominations. Nationwide coverage. 3G Coverage. Access to Mobile Web, Social Networks and a lot more! If you already have a GSM unlocked phone, you just need a Simple Mobile SIM card and have your initial monthly plan activated, and you are all set for a better wireless experience. Unlimited Domestic and International to over 380 countries. See country list. Best features available with Nationwide Coverage: Unlimited Talk, Unlimited US / Global Text, Unlimited 411, Voice Mail, Caller ID, Call Waiting, and access to all toll free US numbers. No extra charges for domestic long distance and roaming for calls placed on Simple Mobile network within the US . Unlimited† Int’l Calling to mobile phones in Mexico, Canada, India, China plus 16 more countries. Simple Mobile number is required to be provided in the shopping cart, and minutes will be directly loaded to the provided Simple Mobile number. - For technical assistance, please call 1-877-878-7908.